In an escalation of tensions, the Obama administration accused Russia on Monday of conducting tests in violation of a 1987 nuclear missile treaty, calling the breach "a very serious matter" and going public with allegations that have simmered for some time. The treaty confrontation comes at a highly strained time between President Barack Obama and Russian President Vladimir Putin over Russia's intervention in Ukraine and Putin's grant of asylum to National Security Agency leaker Edward Snowden. An administration official said Obama notified Putin of the U.S. determination in a letter Monday. The finding will be included in a State Department annual report on compliance with arms control treaties that will be released Tuesday. 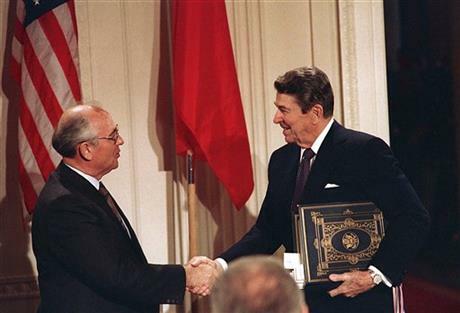 The U.S. says Russia tested a new ground-launched cruise missile, breaking the Intermediate-Range Nuclear Forces Treaty that President Ronald Reagan signed with Soviet leader Mikhail Gorbachev. Russian officials say they have looked into the allegations and consider the matter closed. The Obama administration has expressed its concern over possible violations before, but this is the first time that the administration has formally accused Russia of violating the treaty. It comes in the wake of the downed Malaysian airliner in Ukraine and as the U.S. and the European Union seek to ramp up sanctions against Russia, offering the administration a convenient time to release the report which had been due to come out in April. Two officials said the U.S. is prepared to hold high-level discussions on the issue immediately and want assurances that Russia will comply with the treaty requirements going forward. The officials spoke on the condition of anonymity because they were not authorized to discuss the sensitive issue publicly by name ahead of Tuesday's report. In raising the issue now, the U.S. appears to be placing increased pressure on Russia and trying to further isolate it from the international community. The European Union and the United States plan to announce new sanctions against Russia this week in the face of U.S. evidence that Russia has continued to assist separatist forces in Ukraine. The formal finding comes in the wake of congressional pressure on the White House to confront Russia over the allegations of cheating on the treaty. The treaty banned all U.S. and Russian land-based ballistic and cruise missiles with ranges between 300 miles and 3,400 miles. The officials said the Obama administration has informed Congress and U.S. allies of its decision to seek Russian compliance. Indeed Obama, who has made nuclear disarmament a key foreign policy aim, has little interest in having Russia pull out of the treaty altogether. Obama won Senate ratification of a New START treaty, which took effect in February 2011 and requires the U.S. and Russia to reduce the number of their strategic nuclear weapons to no more than 1,550 by February 2018. Obama last year announced that he wants to cut the number of U.S. nuclear arms by another third and that he would "seek negotiated cuts" with Russia, a goal now complicated by the accusation of a missile treaty violation.